Pokhara University publishes scholarship notice for year 2075. The scholarship notice is for health and allied sciences along with science and technology. 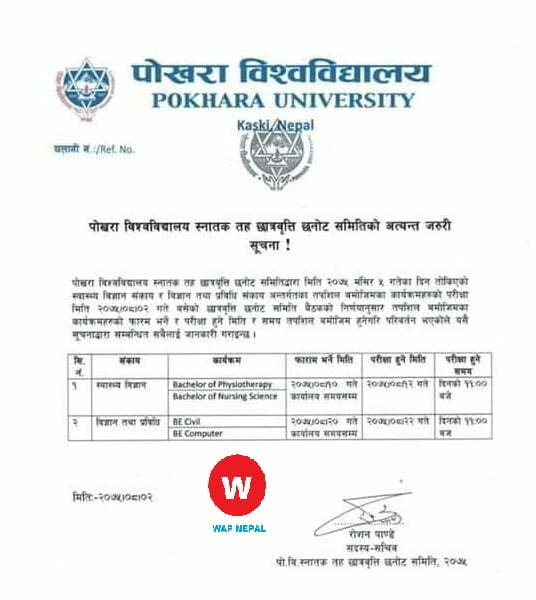 According to the latest scholarship notice by Pokhara University, the scholarship is for undergraduate level.�The bachelor of Physiotherapy and bachelor of nursing science entrance exam will be on 2075/08/12. The bachelor of civil engineering and bachelor of computer engineering entrance examination will be on 2075/08/22. The last date of form for bachelor of physiotherapy and bachelor of nursing science is 2075/08/10. The last date of form submission for BE civil and BE computer is 2075/08/20. The exam will be at 11 am. 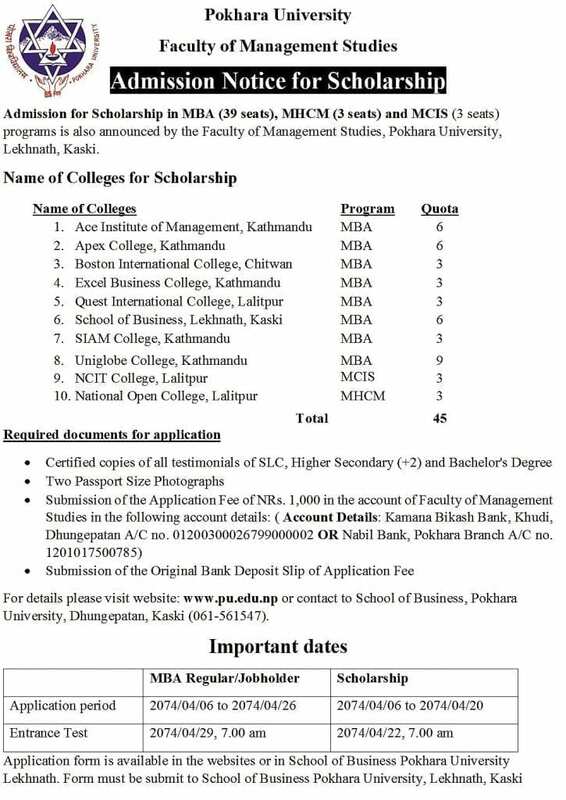 Pokhara University has published an admission notice 2074 for scholarship for faculty of management studies. Admission is announced for management subjects along with 49 seats for MBA, 3 seats for MHCM, 3 seats for MCIS. Different name of colleges for scholarship has been announced. Name of colleges along with their quota and programs have been published. The deadline for application for MBA regular and job holder is from 2074-04-06 to 2074-04-26 and similarly, the deadline for scholarship is from 2074-04-06 to 2074-04-20. The entrance test is scheduled for 2074-04-29 at 7 am in the morning for MBA regular and jobholder whereas the entrance test for scholarship is on 2074-04-22 at 7 am.